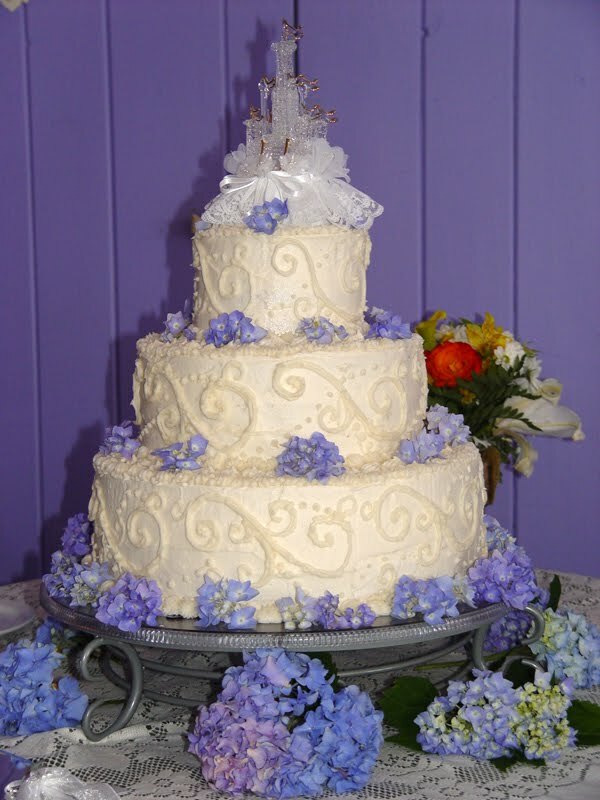 Gorgeous round white wedding cakes to browse through with the central theme of fresh or sugar hydrangea decorations over the cake. Great for a blue or lilac themed wedding. 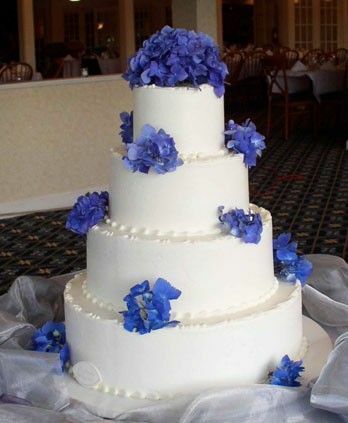 Four tier round white wedding cake with fresh hydrangeas. 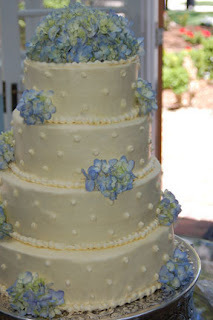 Sugar hydrangea flowers in pale blue on dotted four tier white wedding cake. Four tier round wedding cake with pastel blue hydrangeas and pastel blue satin ribbon separating the tiers. 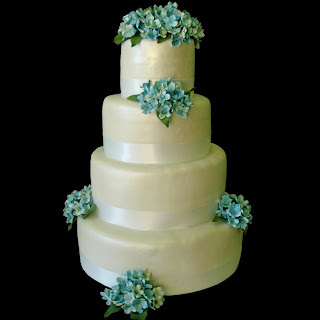 Lovely three tier white wedding cake with sugar hydrangea flowers and green leaves. Three tier white wedding cake with swirls and fresh hydrangeas. Three tier white wedding cake with edible pearl decorations and bright blue hydrangeas. 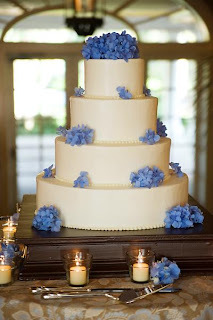 Four tier round white bridal cake delicately decorated with blue hydrangeas. 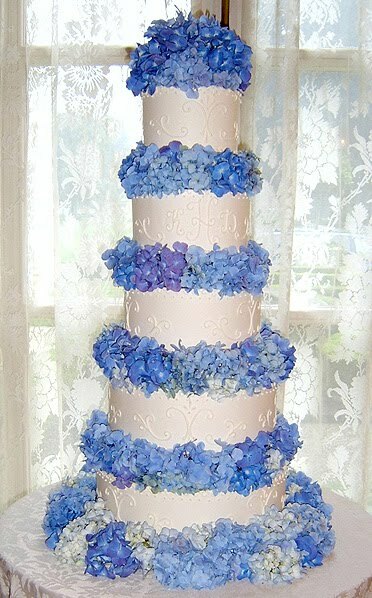 Blue hydrangeas and wide satin ribbon wedding cake. Stunning 4 tier round white wedding cake with white edible pearls on the tiers and fresh pale blue hydrangeas. 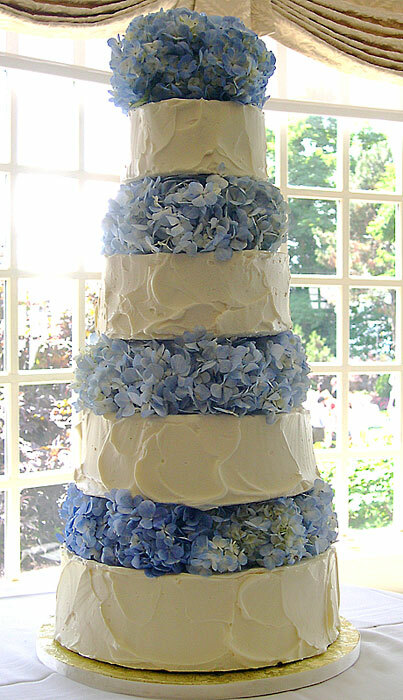 Three tier white wedding cake with scroll texture and lovely blue hydrangeas. 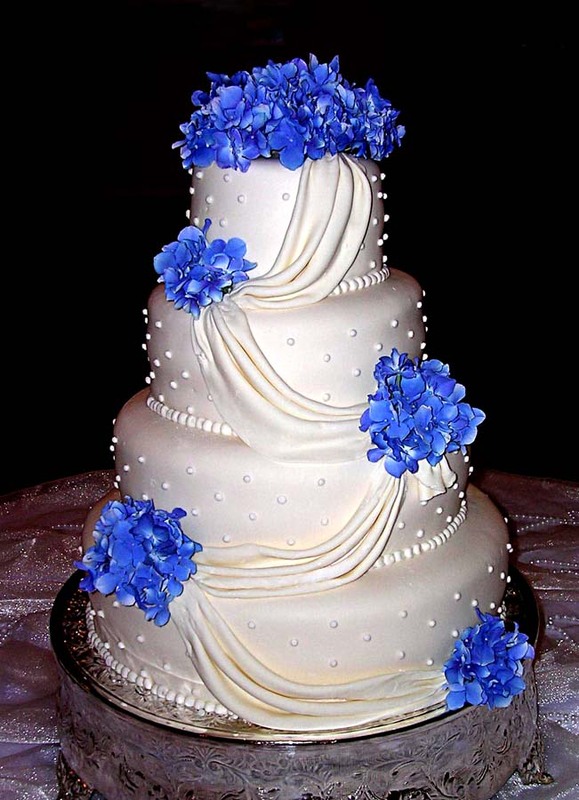 Four tier white wedding cake with draping, edible pearls and blue hydrangeas. 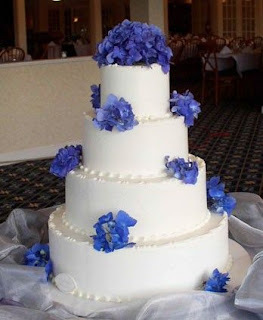 Four tier white wedding cake with white satin ribbon and hydrangeas. Three tier white wedding cake with white bows and blue hydrangeas. 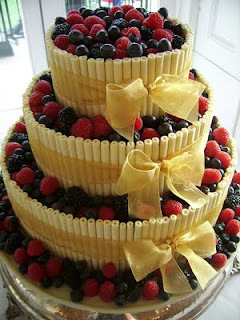 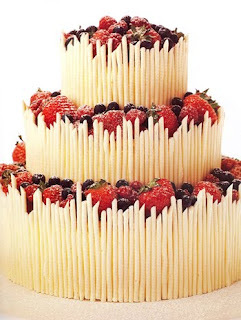 Three tier white chocolate cigarillo wedding cake with strawberries and blue berries! 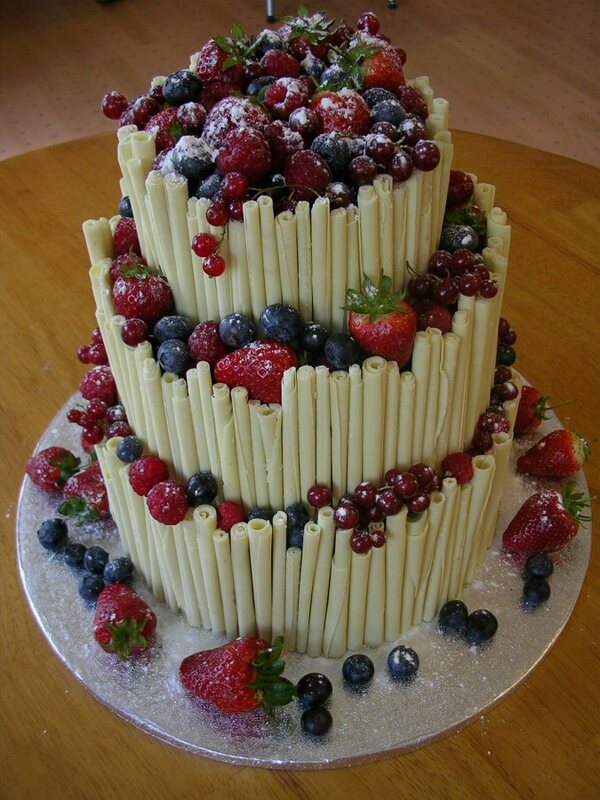 Three tier white chocolate curl cake with a host of yummy summer fruits and berries. 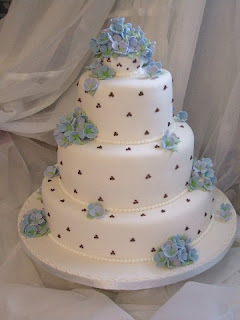 Three tier chocolate curls cake with beige bows and stacked with strawberries and blue berries. 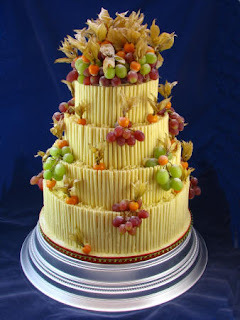 Four tier white chocolate cigarello cake with different colored grapes. 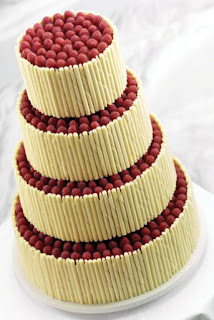 Elegant round four tier chocolate curl wedding cake with raspberries. 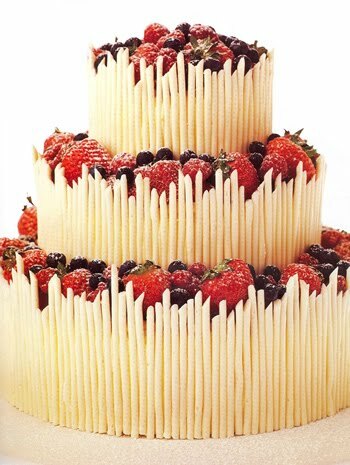 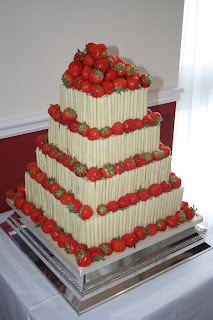 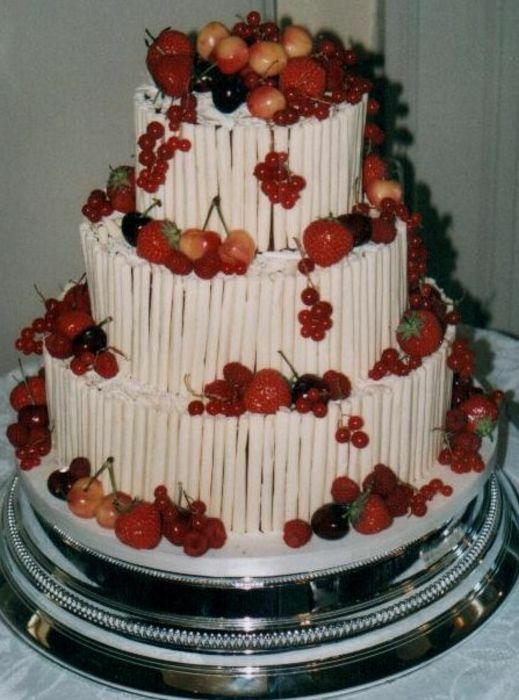 Square white chocolate cigarillos wedding cake with strawberries. 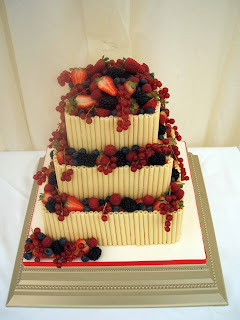 Square white wedding cake with chocolate curls and scrumptious summer fruits. 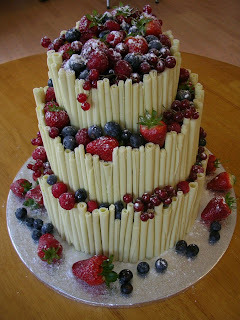 Three tier white chocolate curl bridal cake with summer fruits! 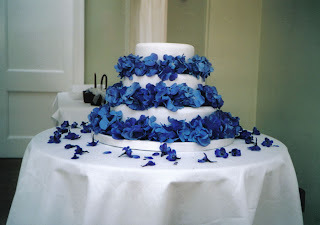 Gorgeous blue hydrangea wedding cake picture gallery with images of different blue hydrangea wedding cakes with the hydrangeas used to separate the white icing cake tiers. 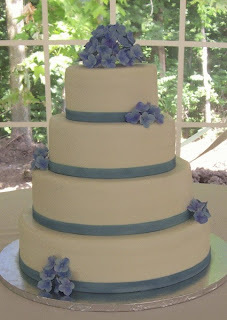 Three tier white round wedding cake with pale blue hydrangeas. 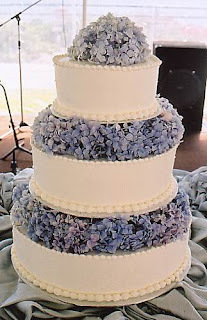 Four tier round white frosted wedding cake with bunches of blue hydrangeas. 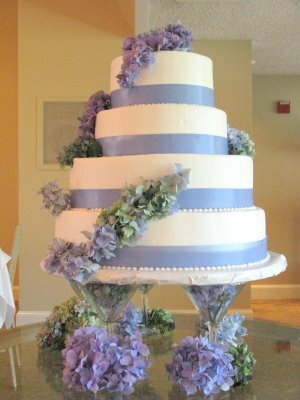 Three tier round wedding cake with lilac blue hydrangeas. Three tier round white icing wedding cake with lots of vivid blue and purple hydrangeas. 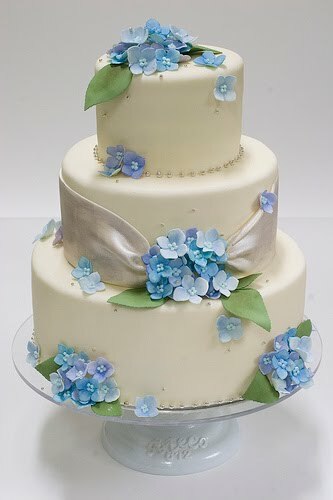 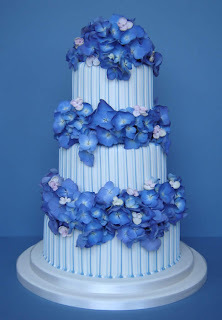 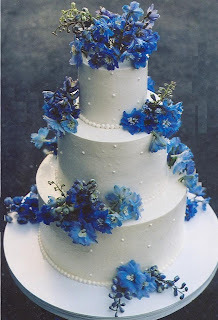 Lovely blue hydrangea wedding cake. 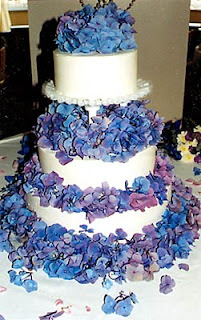 Five tier wedding cake with fresh hydrangeas separating the tiers. Stripy three tier white wedding cake with blue hydrangeas. 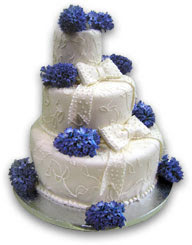 View beautiful Hydrangea Wedding Flowers to match with these blue hydrangea wedding cakes. 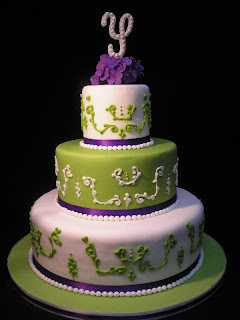 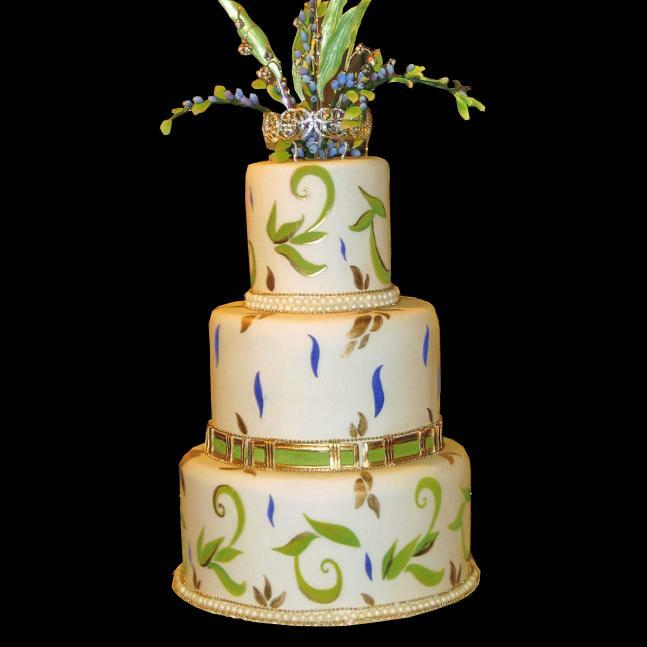 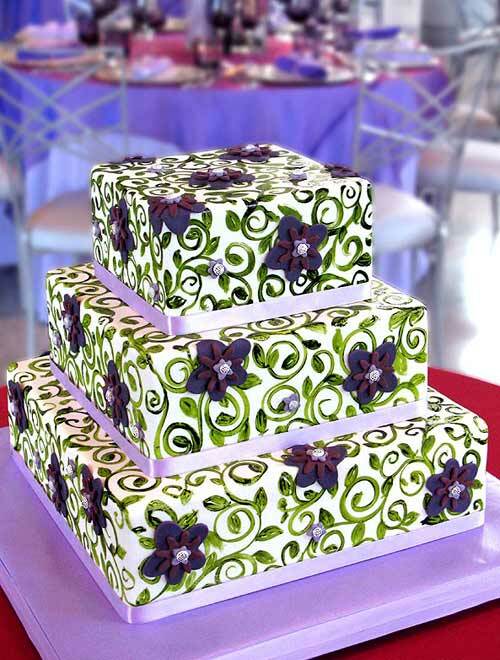 Many pictures of beautiful round wedding cakes with green and purple trim. Which cake is your favourite? Which cake inspires you for your wedding? We appreciate your input in the comments section below! Green and white fondant four tier wedding cake with purple and white roses. 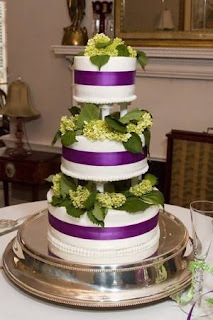 Simple and elegant three tier white round cake with purple and green satin ribbon dividing the tiers and on purple flower attached to top cake tier. 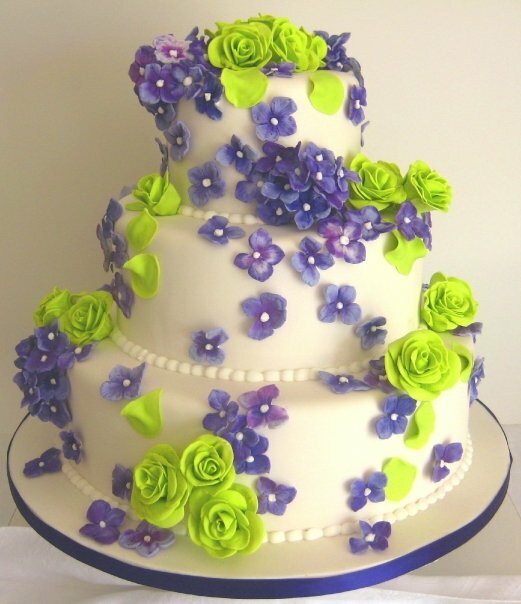 Three tier white wedding cake with lilac flowers and lime green roses encrusting the entire cake. This cake was made by Josie Bancheri from Juicy Desserts. 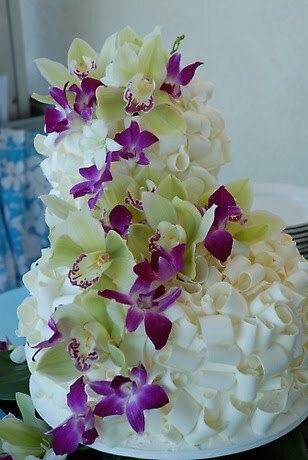 Three tier white chocolate shavings wedding cake decorated with purple dendrobiums and green cymbidium orchids. 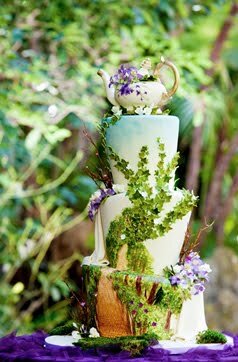 Three tier white Topsy Turvy cake with teapot on top tier, green vine crawling up the cake and purple flowers, beautiful cake for a garden wedding. 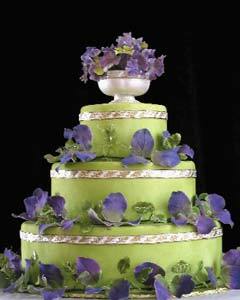 Light green three tier wedding cake with purple petals. 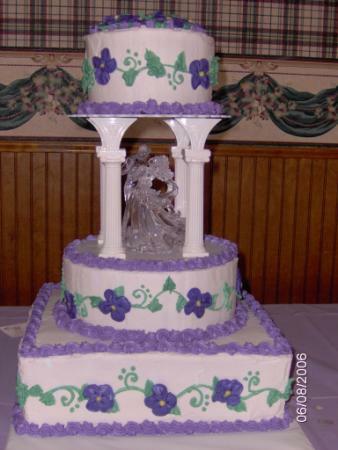 Three tier white wedding cake separated by columns with wide purple satin ribbon and green flowers. Three tier green and whit scroll wedding cake with purple satin ribbon and purple flower. 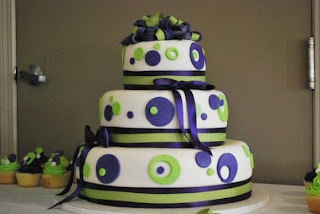 Modern three tier wedding cake with purple and green decorative circles. Not technically a round wedding cake but a gorgeous four tier wedding cake in the shape of a hexagon decorated with white ornamental patterns, purple roses and green foliage. 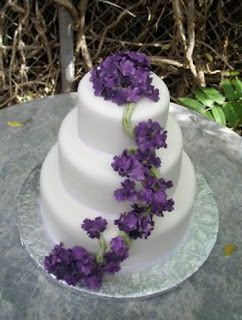 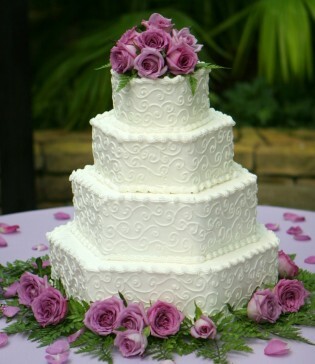 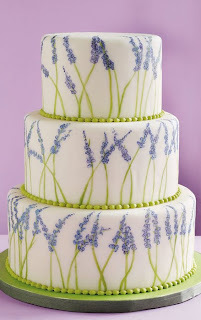 Three tier white round wedding cake decorated with lavender flowers. 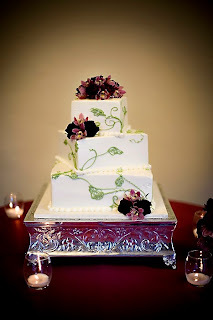 Gold, purple and green hand painted wedding cake, a row of pearls lines each tier. Purple and Green square wedding cakes pictures to inspire you for your wedding. 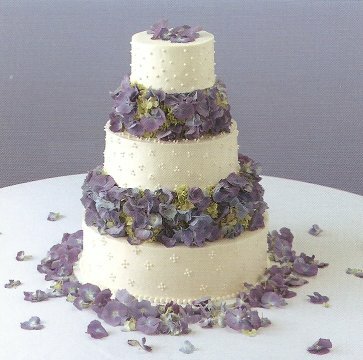 Purple and green embellishments on white look refined, sophisticated while also being earthy. 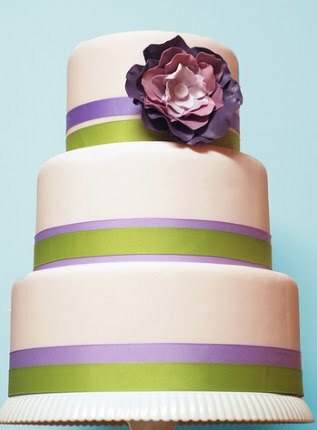 Stunning three tier purple and green wedding cake decorated with lilac ribbon, purple fondant flowers and green patterns and scrolls. Lovely three tier square wedding cake in white cream textured with white scrolls and embellished with purple ribbon and purple and green flowers. 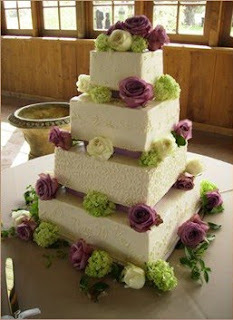 Four tier white textured wedding cake generously decorated with lovely purple, green and white roses. Lovely lilac and green embellished three tier wedding cake with columns and glass topper in the middle of the cake. 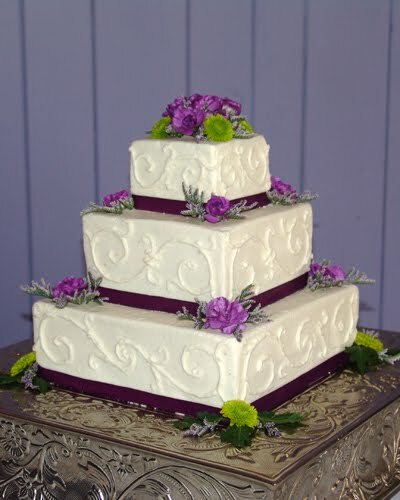 Elegant three tier square white wedding cake with green icing leaf patterns and purple fresh flowers. 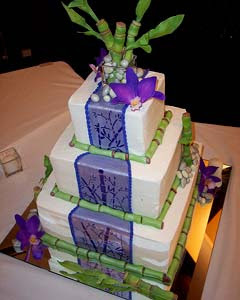 Asian themed square wedding cake with purple ribbon and flower and green bamboo shoots. 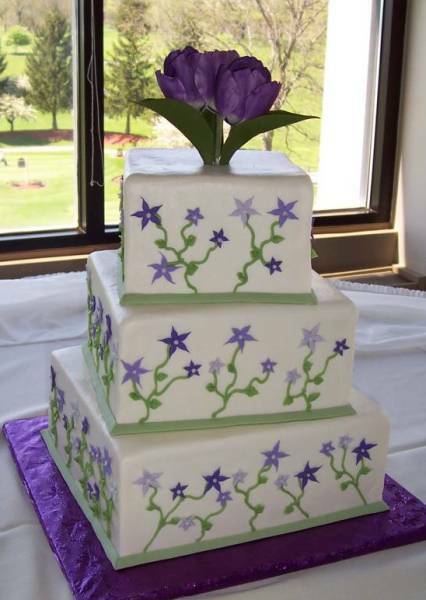 Purple and green square wedding cake with purple stars and tulips. Seashell wedding cakes pictures with lots of seashells and blue trimming on the cakes. 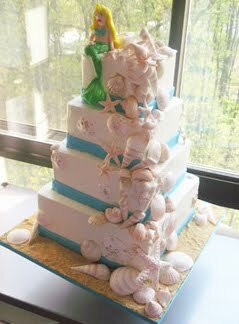 Two tier round wedding cake with Tiffany blue ribbon separating the tiers and pretty seashells decorations. Stunning three tier round white seashell wedding cake with light blue and lilac colored seashells. 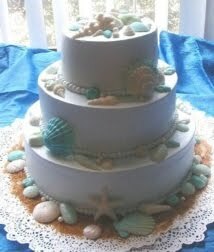 Two tier round and white wedding cake with white and light blue sugar seashells and coral. 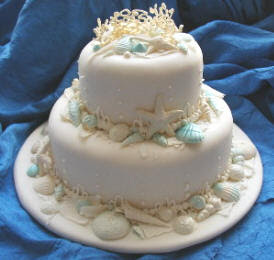 Delicate three tier round white wedding cake decorated with white and blue seashells. 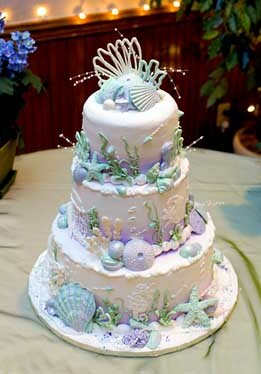 Stunning four tier square white wedding cake with blue ribbon separating the tiers, white seashells cascading down one side of the cake and a cute colorful mermaid cake topper. 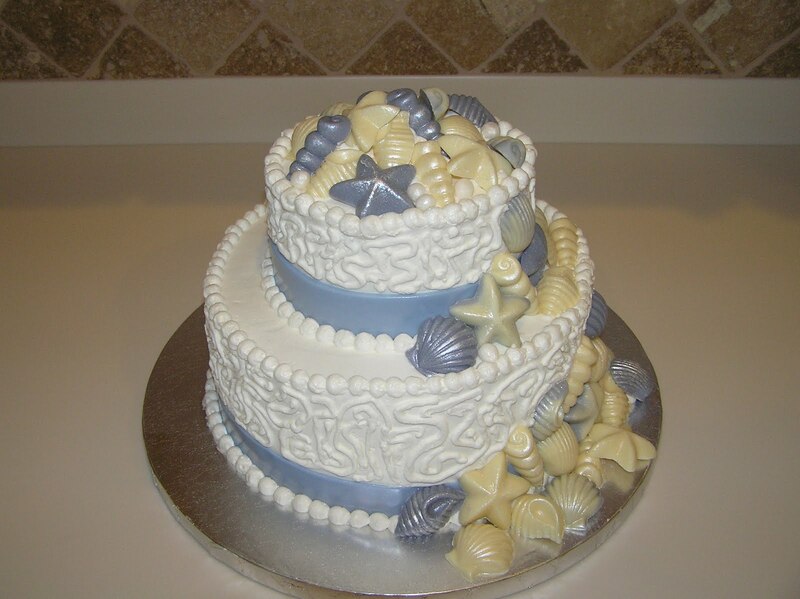 Three tier round white wedding cake with light blue and light yellow seashells. Beautiful two tiered wedding cake with textured tiers and encrusted with metallic pastel blue and yellow seashells. 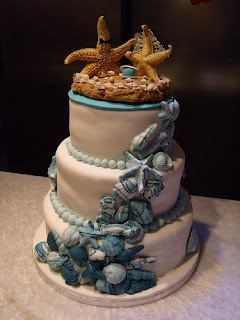 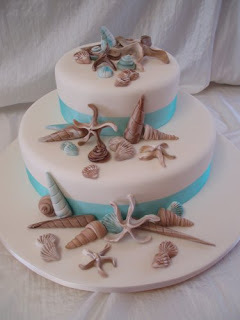 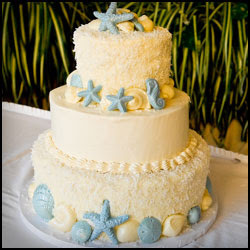 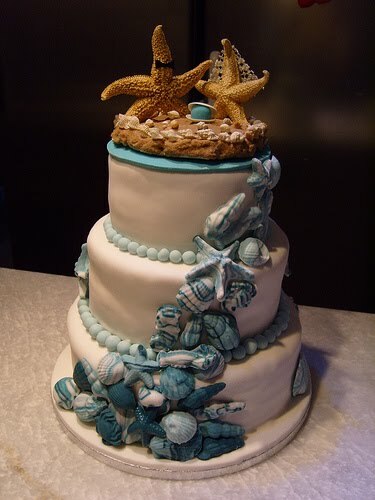 Elegant beach theme wedding cake encrusted with blue seashells and cute starfish cake topper. 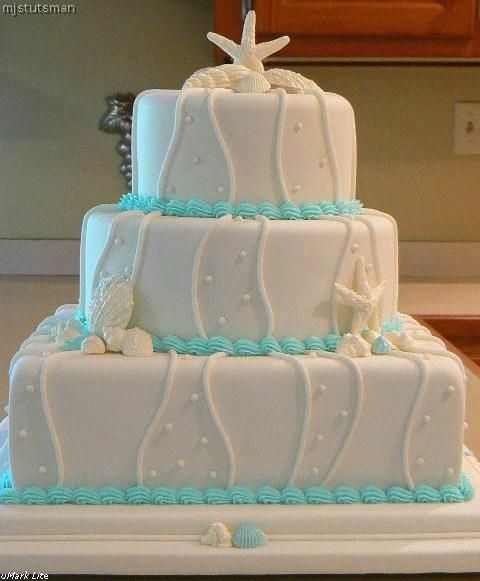 Stunning three tier white wedding cake with white seashells and tiffany blue icing decoration separating the tiers.